00:00 Live from Las Vegas, Fox5 News This Morning starts now. 00:04 Jason: Some stories are just gift-wrapped in a nice bow and handed to us, and this is one of them. 00:17 Monica: He and his chrome dome are doing some investigating this morning over at CosmoProf. It’s the convention designed for all things in the beauty industry. So, Mike, there’s some new techniques out there for you? 00:38 MD: I’d have to watch mine grow in one of these three tubes with this new SmartGraft. It’s like the, what’d you call it, the iPhone of hair grafting? 00:45 Dr Alan Bauman: SmartGraft is the iPhone of hair transplant surgery devices. 00:50 DB: This is a device that allows us to take the individual follicles, one at a time, from the back of the scalp, without leaving any linear scarring behind. 00:58 MD: And that’s important. I guess I would never know, I haven’t had this done, but pain and scarring is kind of a big deal? 01:05 DB: Correct. So old styles procedures left a linear scar, had a long downtime, stitches or staples. This procedure has a much less downtime, much less discomfort, much quicker recovery, and absolutely no linear scar left behind. 01:30 DB: Absolutely. So that’s… The greatest innovation with this device is that when the follicle is harvested, it’s gonna then be transferred and stored right into this container, where it’s gonna be kept moist and cool while it’s awaiting transplantation. And the reason why we want that is because it’s gonna improve the growth rate and then the quality of hair on the backend when it grows. 02:09 Monica: But, Mike, this is really interesting stuff. I mean, imagine folks who have lupus or other diseases. I know folks who have and they’ve lost their hair. Is this for women as well? 02:20 MD: Well, so Monica’s asking, people with lupus who have lost their hair, for women, could this help women as well? 02:26 DB: So if you have a scarring type of alopecia, a hair transplant is probably not gonna work for you. But it’s really important to go see a board certified hair restoration physician to really get the proper diagnosis so you know what’s right for you, whether it’s a medication, a laser light device, PRP, platelet-rich plasma treatment, or hair transplant surgery. 02:47 DB: The American Board of Hair Restoration Surgery is the place to go to find the board certified doctors. There’s only about 200 of us, and we’re board certified in hair restoration surgery. 02:56 MD: Alright. Well, I hope that answers that. By the way, 130,000 hair follicles on an healthy head of hair. I have probably less than 30,000. 03:05 Monica: Alright. right now. 03:08 Jason: I knew that would be a great, great report. 03:10 Monica: I knew it was. Yeah, of course. Bauman Medical was founded in 1997 with a single mission… to improve the physical appearance and in doing so the mental health of its patients through optimum hair health and hair restoration. Dr. Alan J. Bauman, MD, ABHRS, is among a very selected group of physicians worldwide to earn Board Certification from the prestigious American Board of Hair Restoration Surgery (ABHRS) and accepted by the International Alliance of Hair Restoration Surgeons (IAHRS). He has achieved Fellow status with the esteemed International Society of Hair Restoration Surgery (FISHRS). Under the doctor’s leadership, Bauman Medical delivers exceptional and consistent results. In total, Bauman Medical has treated over 20,000 hair loss patients while conducting more than 8,000 surgical hair transplant procedures since its inception. Through his 501(c)(3) non-profit Bauman Philanthropic Foundation, Dr. Bauman and his team provide pro-bono hair restoration, surgical hair transplant and medical treatment to patients in need. Dr. Bauman was recently voted North America’s #1 Top Hair Restoration Surgeon by Aesthetic Everything. Dr. Bauman is a frequent guest expert and faculty member at many major international medical conferences. In addition to teaching and consulting worldwide, he personally sees patients and performs procedures at Bauman Medical Hair Transplant and Hair Loss Treatment Center — an 11,000 sq. ft. stand-alone medical facility located in downtown Boca Raton, one of the largest facilities of its kind in the country. How did Dr. Alan J. Bauman MD become interested in Hair Loss, Hair Transplantation and Hair Restoration? What were his early influences in life and medicine? What is his practice philosophy? What were the main challenges he faced when starting his hair restoration practice? Find out these answers and more during this in-depth interview for the “Redefining Medicine” series by the American Academy of Anti-Aging Medicine hosted by Monica Goldstein. At Bauman Medical, Dr. Bauman uses the scientific tool called HairCheck with every single patient and every single visit to assist with hair loss diagnosis and monitoring results from treatment. HairCheck quickly measures the quantity and quality of hair without a tattoo or trimming of hair. The same area can be tracked over time because of the locator device which is used prior to performing the measurement. The device also measures hair breakage, a common cause of hair loss. Dr. Bauman has developed a certified training program called “HairCoach” to teach medical and beauty professionals on the proper use of HairCheck. Dr. Bauman has performed over 40,000 HairCheck measurements on his patients since 2009. In November of 2012, WPBF ABC News Palm Beach visited Bauman Medical Group and certified HairCoach Lauren Donald of Bond Street Salon to discuss the HairCheck device. See the video of this exciting news story above. Come in for your HairCheck evaluation today! If you are starting or currently on a treatment regimen, HairCheck is the best way to track your hair growth results. Should you change your hair loss treatment? Is rogaine minoxidil working to improve your hair growth and prevent loss? How much is your shedding causing a decrease in hair volume? Is your PRP Hair Growth treatment working in all areas as expected? When should you repeat your PRP Hair Growth treatment? HairCheck at BaumanMedical can give you the hair loss answers you need! HairCheck measurements are recommended at important intervals and should be taken BEFORE starting or changing your hair loss treatment regimen. Get measured with HairCheck as soon as possible. Is your hair volume above or below average? HairCheck can tell you your hair volume and how it compares to normal. It can also compare the areas affected by hair loss or hair breakage with the more healthy or permanent areas of the scalp to assist with hair loss diagnosis. Schedule your HairCheck today! Patient Richard Alba underwent his ARTAS robotic-assisted FUE Hair Transplant along with PRP+BioD extracellular matrix with Dr. Alan J. Bauman in Boca Raton, FL six months ago. During his procedure at Bauman Medical, 2,600 grafts were carefully and artistically transplanted to the frontal hairline, temples, and his thinning crown area. In this video he gives an unbiased review of the hair transplant and update on his progress regarding his hair growth, which is now at 50% of the final expected results. A few months earlier during his initial healing phase just four days after his procedure, he provided information on the comfort level he experienced during his ARTAS robotic hair transplant. That video called “Is An ARTAS Hair Transplant Painful?” is located here. Learn more about ARTAS FUE Hair Transplantation by Dr. Bauman. Misty is a 37-year-old Caucasian female burn survivor who lives in San Antonio, TX and her story is as follows: For the last 24 years, Misty has been searching for a solution to her life-long struggle of trying to conceal the bald, scarred area on her scalp. About 25 years ago, Misty’s scalp was severely burned by a hot grease fire. In an attempt to save her dog from the smoke and flames inside her house, Misty slipped backward as she rushed past her brother who was carrying a skillet of flaming and smoking cooking grease. The grease splashed onto her head and severely burned 75% of her scalp and some of her face. Misty has endured over 12 surgeries throughout the years as surgeons worked to graft the skin back onto her head. While the skin grafts were successful, Misty was left scarred and disfigured at the tender age of 12 years old. Misty has endured the stigma of this horrible accident and her resulting disfigurement and has experienced tremendous challenges finding steady and/or meaningful employment throughout her life. 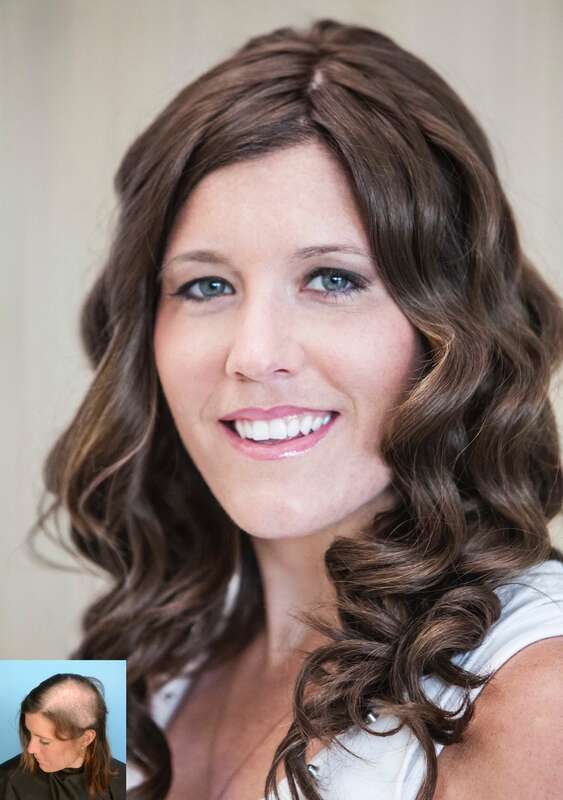 To try to conceal her scalp, she has been in a constant battle throughout the years trying to find wigs that she can afford. Because of these low-quality, ill-fitting wigs, she struggles with excessive irritation and, occasionally, small wounds due to the poor quality of these hairpieces and the friction they cause. Because of her current financial situation, she is unable to maintain and care for her scalp and her remaining hair as she should, much less afford the proper tapes and adhesives for her current wig. She learned about Dr. Bauman’s non-profit foundation through celebrity hairstylist Martino Cartier’s fundraiser in NJ called Wigs and Wishes where Dr. Bauman was awarded the “Guardian Angel Award,” and reached out to contact him. Dr. Bauman provided Misty with a pro bono 3d-printed “CNC” Italian Hair System / Medical-Grade Cranial Prosthetic at Bauman Medical Group on Tuesday June 20th. The high-tech hair and scalp prosthetic has been under construction in Italy for 12 weeks and took over 240 man-hours to create using 3D-printing technology and approximately 100,000 strands of 100% unprocessed “virgin” human hair. Sometimes called the “Vampire PRP Treatment,” Platelet Rich Plasma PRP Hair Regrowth therapy by Dr. Alan Bauman uses a patient’s own blood to stimulate hair growth from existing follicles. PRP contains powerful growth factors which have been shown to enhance hair growth without drugs or side effects. As an alternative to ACell/Matristem, new research is underway to determine the effects of adding placenta-derived Amnionic / Amniotic Extracellular Matrix (BioD), an FDA-approved cryopreserved injectable allograft that contains amnionic cells and other ingredients which the body can use for tissue regeneration and repair. For more information about hair loss and advanced hair growth treatments such as Vampire PRP Platelet Rich Plasma w/ placental tissue ECM, contact Dr. Alan Bauman, MD, ABHRS, FISHRS. 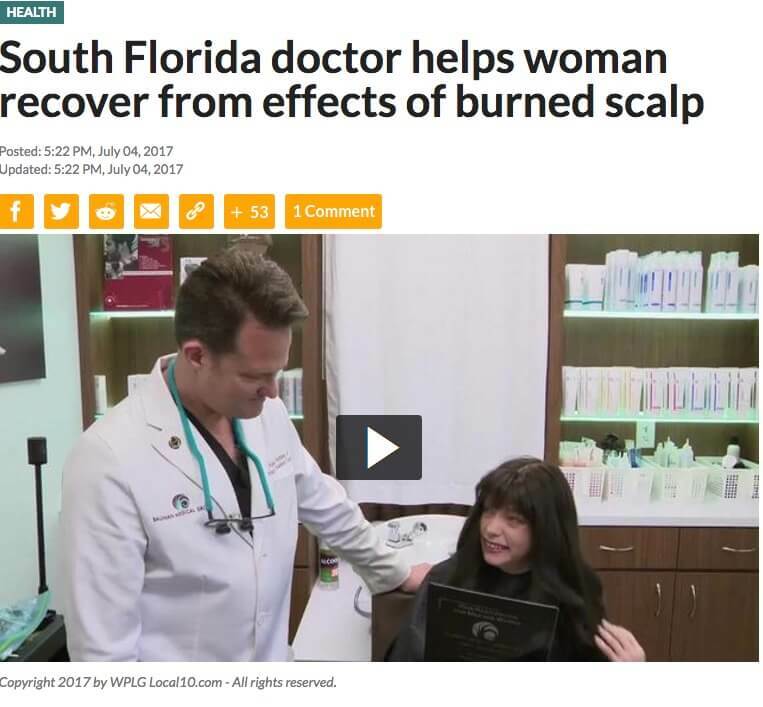 Recently, Misty’s hair restoration story aired on WPLG Local10 News Miami in Florida. Burned severely on her scalp during a kitchen fire as a child and after multiple surgeries to reconstruct the area, unfortunately, she is not a candidate for hair transplantation. However, more than 26 years later, the CNC Hair and Scalp Cranial Prosthesis made with 3D-Printed technology from Bologna, Italy and provided by Hair Restoration Physician, Alan J. Bauman, M.D. in Boca Raton, Florida, is the answer. After more than a quarter century without a full head of hair, Misty receives the Italian Hair System and is able to shower, shampoo, style, swim, etc. and enjoy an uncompromised lifestyle that a full head of hair brings. The cost of Misty’s CNC Hair & Scalp Prosthetic was subsidized by the Bauman Philanthropic Foundation. Learn more about CNC Cranial Prosthesis for Hair and Scalp at Bauman Medical in Florida. The medical-grade CNC Hair & Scalp Cranial Prosthesis or Italian Hair Replacement System Misty received was provided by renowned board-certified Hair Restoration Physician, Dr. Alan J. Bauman, MD, ABHRS, Medical Director of Bauman Medical Group in Boca Raton, Florida and founder of the Bauman Philanthropic Foundation–a 501(c)(3) organization dedicated exclusively to providing hair restoration treatments and services to those in need. Much more than a “medical wig,” the non-surgical dermato-compatible CNC Cranial Prosthesis has been approved as a medical device in Italy and is appropriate for certain male or female hair loss patients, including those who have scars or scarring alopecia, burns, or autoimmune hair loss due to inflammation (alopecia totalis and universalis) and even chemotherapy. It can also be used in place of traditional hair extensions, wigs and weaves when something more stable, non-itchy, non-removable and more “friendly” to hair and scalp is desired due to athletic or other activities. A portion of the cost of a cranial prosthesis or cranial prosthetic device is often covered by insurance. If you or someone you know has suffered hair loss and might benefit from a Cranial Prosthesis or other Hair Restoration treatment or procedure, please visit www.BaumanMedical.com for more information on CNC hair restoration options and to start a long-distance or in-person consultation. VIDEO: How Does HairCheck Measure Hair Loss and Hair Growth Results? HairCheck(TM) is a non-invasive way to scientifically measure and track the amount of hair growing in a given area of scalp (called your Hair Mass Index, “HairNumber” or “HairScore”). The HairCheck device is a very sensitive ‘trichometer’ which measures hair caliber and hair density together in a single number. HairCheck is included with the initial consultation at Bauman Medical Group and HairCheck HMI measurements are recommended every 90 days (3 months) to track hair growth results, so we can know what treatments are working and how well. No hair trimming or tattooing is necessary to scientifically track your HMI measurements in the exact same area again and again because of the clever scientific design of the stereotactic scalp-location tool and the electronic caliper device. Dr. Bauman has performed well over 40,000 measurements using the HairCheck device in his medical practice and taught hundreds of physicians and other professionals how to use the device through his HairCoach(R) program. In addition to thousands of patients, HairCheck has been used by Dr. Bauman in cosmetic product testing and scientific FDA clinical trials for Fortune 500 companies and medical device manufacturers. The scientific validity of HairCheck Trichometer has been independently validated by researchers and scientists who have published a number of scientific journal articles. HairCheck is used around the world to help physicians diagnose as well as track and monitor hair loss and hair regrowth in their patients. HairCheck can also be used to disprove “bogus” treatments and false product claims often made by companies promoting hair growth treatments to consumers. Genny survived brain cancer surgeries and radiation which left her with significant baldness and hair loss over a huge area of her scalp. The CR-Lab CNC hair and scalp cranial prosthesis was used to restore her full head of hair. Are YOU experiencing hair loss? Some social factors like Divorce, Smoking, Stress, Alcohol intake as well as medications, nutrition and hereditary causes can play an important role in hair thinning and hair loss. At Bauman Medical Group, since 1997 we’ve helped women and men from across the globe maintain, enhance and restore their own living and growing hair with new, effective treatments. A nationally-recognized and leading hair loss expert, Dr. Alan J. Bauman is one of a handful of physicians worldwide who is a Diplomate of the American and International Board of Hair Restoration Surgery, recommended by the American Hair Loss Association and member of the esteemed International Society of Hair Restoration Surgery. Eyelash Transplant procedures were initially used for trauma patients. Loss of eyelashes allow for the entry of dirt and dust into the eye area. This eyelash transplant patient, Peggy Martin, was in a car accident and nearly lost her life 15 yrs ago. She had damage to her eyebrows and eyelashes after a motor vehicle accident when her car was nearly crushed by a tractor-trailer. Dr. Bauman used eyelash transplants to give her back her lashes in 2002. Eyelash loss can occur from trauma, disease, illness (like trichotillomania), eyelash extensions as well as from age and heredity. Depending on whether eyelash follicles exist in the lid, surgical or non-surgical treatments are available to replace or enhance eyelash growth, restoring a more symmetrical and aesthetically pleasing eye area. Want to learn more about eyelash transplants or find out if you are a candidate? Request a consultation with Dr. Bauman at www.baumanmedical.com. Is an ARTAS robotic hair transplant painful? Listen to Richard describe his ARTAS robotic-assisted hair transplant experience with Dr. Alan Bauman of Bauman Medical Group in Boca Raton. We caught up with Richard in the hallway at Bauman Medical where he was talking about how he felt before, during and after his procedure. We asked his permission to share his experience with you. Was he afraid of the discomfort he was going to experience? What was his experience like? How much pain did he have during and after his hair transplant? How is he feeling today? Richard is four days post-op from his more than 2600 graft ARTAS robotic hair transplant, so his scabs will be visible for another few days. Once the scabs are gone, all visible signs of the hair transplant will be invisible to the naked eye. Hair growth starts in about 12 weeks, but it takes 6 months to see half of the result. A full-grown result takes one year. Each patient is different, so a consultation is required to determine the estimated amount of grafts needed to reach your goals. Contact Dr. Alan Bauman, a board-certified Hair Restoration Physician and expert in artistic, minimally invasive FUE hair transplant surgery with NeoGraft and ARTAS. This year’s ISHRS – International Society of Hair Restoration Surgery World Congress on #HairTransplant was held at Caesar’s Palace in Las Vegas, NV. Fox5 reporter Mike Doria visited with ISHRS Fellow member Dr. Alan Bauman to get the latest information on the 9.X ARTAS Robotic-Assisted Hair Transplant System for FUE or no-linear-scar Follicular Unit Extraction. The ARTAS robotic hair transplant system is the most advanced surgical device in the field of hair transplant surgery. Hair Transplant Results from Dr. Alan J. Bauman from Alan J Bauman on Vimeo. View these slideshows of hair transplant results, hair restoration results, and the results of medical treatments for hair loss of patients who have been treated by board-certified hair transplant surgeon, Dr. Alan J. Bauman M.D. at Bauman Medical in Boca Raton, FL. Most of the included hair transplant results are shown after 12 months of growth, unless otherwise specified in the video. Dr. Alan Bauman uses a combination of surgical skill and artistic ability to create 100% natural restorations of living and growing hair for his patients. A focus on minimally-invasive “FUE” harvesting methods using NeoGraft or ARTAS-assisted procedures allows for a no scalpel, no stitch approach to the delicate Donor Area of available follicles in the back of the scalp. This approach produces absolutely NO linear scar in the donor area to hide, meaning no restrictive hairstyles are required after healing is complete. Dr. Bauman artistically designs each unique wavy, feathery hairline and hair restoration results for his patients, so results are 100% natural and defy detection. This is accomplished with microsurgical precision using special lighting, magnification and proprietary instrumentation. See this video of before after photos and look closely at the dramatically natural improvements in the frame of the face, scalp coverage and results in other areas (sideburns, beards, eyelashes, eyebrows, etc.) in Dr. Bauman’s hair transplant patients. Thinning hair and hair loss has been traditionally treated with medications and surgery. However, newer modalities such as non-chemical laser therapy and cell therapy such as Platelet Rich Plasma has now opened the door to a holistic, non-chemical and side-effect free way to address thinning hair. Like the application of fertilizer to a garden, the growth factor proteins stored inside platelets have very powerful physiologic effects on follicles that are weak (but not dead and gone). But what can someone expect from PRP Platelet Rich Plasma in terms of results? Are there ways to make the treatment more effective and required less often? Cosmetic surgery and industry expert Michele Garber (NipTuck Coach) spent some time chatting about PRP for Hair Regrowth FAQs with Dr. Alan Bauman from Bauman Medical Group in Boca Raton, Florida–a pioneer in PRP for hair regrowth who has taught his sought after techniques of preparation and application to over one hundred professionals. When it comes to combating hair thinning and hair loss, the latest non-invasive treatment is PRP, platelet rich plasma. But not every doctor is preparing and applying PRP the same way. We may not know exactly why ECMs like ACell and BioD make the PRP work stronger and longer, but early studies support this observation. How is PRP performed by board-certified Hair Restoration Physician, Dr. Alan Bauman at +Bauman Medical Group Hair Transplant & Hair Loss Treatment Center? How often does it need to be repeated? How do we measure PRP results? What can you expect when PRP is performed with ECM Extracellular Matrix like ACell or BioD? What benefit does PRP have for hair transplant patients? Can PRP be used in conjunction with laser therapy or compounded minoxidil 82M? Listen to this informative discussion with Michele Garber, The NipTuck Coach and board-certified Hair Restoration Physician, Dr. Alan J. Bauman. Are you a candidate for PRP for Hair Regrowth? Ask Dr. Bauman a question or start your consultation today! This year, Dr. Alan J. Bauman, M.D. attended the 2016 ARTAS® Robotic-Assisted Hair Transplant Users Meeting at the Ritz-Carlton in Laguna Niguel, California. At the meeting, Dr. Bauman joined an elite group of hair restoration surgeons and staff members who made presentations on ARTAS FUE procedure essentials and best practices for success. This video was a candid and impromptu discussion about hair transplants with The Bald Truth author and radio talk show host Spencer Kobren–also a featured speaker at the conference. Mr. Kobren presented a incredibly well received lecture on the topic of “The Patient Perspective” in hair transplantation. Dr. Bauman is a board-certified hair transplant surgeon, has over 20 years of experience in hair restoration surgery and is a recognized leader in the field. In addition to participating in a question and answer (Q&A) panel, Dr.Bauman delivered an exciting and innovative presentation geared toward helping fellow physicians make the most out of ARTAS® robotic-assisted FUE hair transplant technology. During the conference, Dr. Bauman spent time speaking with Spencer Kobren who is the Founder and President of the American Hair Loss Association, the nation’s foremost organization dedicated to educating the public, healthcare professionals, and the mainstream media about the emotionally devastating, and life altering disease of hair loss. Mr. Kobren is considered the country’s most prominent and effective consumer/patient advocate. He’s the author of the ground breaking International Best Seller, The Bald Truth; The First Complete Guide to Preventing and Treating Hair Loss (Pocket Books/Simon & Schuster), which has become the most widely read consumer hair loss guide of all time. Published in five languages and sold in every English speaking country in the world, The Bald Truth has touched the lives of countless hair loss sufferers in search of real hope. His second book The Truth About Women’s Hair Loss; What Really Works for Treating and Preventing Thinning Hair (Contemporary Books/McGraw-Hill) has changed the way medicine and society looks at this neglected epidemic. Spencer is also the founder of the esteemed and exclusive International Alliance of Hair Restoration Surgeons (IAHRS.org) of which only a small number of surgeons worldwide are accepted and recommended. JOHN ZARRELLA, CNN CORRESPONDENT (voice-over): In a canary yellow Ferrari, Reinhardt Fischer pulls up to the posh Boca Raton resort. Fischer, an investment banker from London, has done well enough to pamper himself: a fruit salad lunch at the cabana overlooking the ocean, an afternoon immersion at the spa. But Fischer’s idea of a relaxation is a bit hair-raising. You see, Reinhardt’s good time is a hair restoration vacation. REINHARDT FISCHER, HAIR TRANSPLANT PATIENT: You come out of these things, you feel like brand new, you had like a car inspection: new oil, new gas. Here you are. It’s great. ZARRELLA: The idea is the brainchild of Boca doc Alan Bauman. UNIDENTIFIED MALE: That’s the area of most concern right there, in the crown, that we need to finish off. ZARRELLA: Bauman, a hair transplant specialist, found his patients, mostly well-heeled if not well-headed, wanted a total feel- good experience. For the starting price of about $4,000, one can be treated and transplanted at the same time. DR. ALAN BAUMAN, BAUMAN MEDICAL GROUP: Now that I’m looking at it, I think I may be doing about 500 or so into the crown here. ZARRELLA: Reinhardt is on his third transplant. This is what he looked like before the first two. In micrografting, Dr. Bauman removes a section of scalp and healthy hair from the back of Reinhardt’s head. FISCHER: As long as I can keep something natural and put a kind of spike of youth in it, and still grow old with dignity. That’s what I intend. ZARRELLA: Surgical technicians separate out the hairs into what is called folicular units, while Bauman marks the sites where they will be transplanted into bald spots. (on camera): Reinhardt, how you holding up? ZARRELLA: In this part of the procedure, Dr. Bauman and the surgical technicians will transplant the grafts. It’ll take them about an hour and a half to two hours, to transplant 1, 000 grafts. (voice-over): Forming a hairline and shaping a crown, Bauman says, is more artistry than surgery. BAUMAN: I would say this procedure is 90 percent art. You need to have the paint brushes, you need to have the right tools, but you also have to have an aesthetic eye. ZARRELLA: The surgery takes about four hours. What it comes down to for Reinhardt, if you really want to split hairs, is about $7 a graft to really feel good. John Zarrella, CNN, Boca Raton, Florida. May 2014 – The ever increasing prevalence of eyelash extensions have prompted ophthalmologists to issue warning about their use. Eyelash Transplant pioneer, Dr. Alan Bauman of Boca Raton, FL has noted a increase in the number of patients with eyelash damage from glued-on false eyelashes and eyelash extensions. When eyelash damage occurs, you will see missing, short, sparse or broken lashes in the eyelid area. Over time, this is the result of false lashes and eyelash extensions being attached to the existing lashes. This kind of “Traction Alopecia,” normally seen due to hair extensions, weaves or tight braids in the scalp as well as in trichotillomania (hair pulling) patients, can also occur in the eyelashes. When eyelash damage occurs, eyelash growth medications like Latisse (bimatoprost) will not work because the follicle is missing or severely damaged. Eyelash Transplantation is the only option for patients with missing or damaged eyelash follicles. Eyelash transplant is a delicate microsurgical procedure which takes about an hour per eye. Hair follicles are harvested from the back of the scalp and implanted comfortably into the eyelid under local anesthesia. It takes about a week for the residual bruising and swelling to resolve and the new lashes grow starting in about six to twelve weeks. Eyelash transplants grow long so routine trimming is necessary. Unlike eyelash extensions, eyelash transplants last longer so there is less costs in the long run. Dr. Alan Bauman’s eyelash transplant procedures have been featured on CNN, NBC Today, ABC Good Morning America, CBS Early Show, Newsweek, Access Hollywood, EXTRA, Vogue and others. Dr. Alan J. Bauman has authored numerous textbook chapters on his technique of Eyelash Transplantation in the field of Hair Transplantation and has lectured and taught his technique internationally to his surgeon colleagues and others. May 2014 – PRP Platelet Rich Plasma – In the search to improve his patients’ results with PRP Hair Regrowth, hair loss expert Dr. Alan Bauman is the first board-certified hair restoration physician to study a new alternative to ACell which contains cryopreserved placental tissue called BioD-Restore. In appropriate hair loss patients, Dr. Bauman will prescribe PRP hair regrowth to rejuvenate weakened follicles and protect hair follicles from miniaturization. What is PRP Hair Regrowth? PRP is a non-surgical, non-invasive method of hair growth stimulation and tissue regeneration which takes less than one hour in the office. With PRP hair regrowth treatment, there is no recovery and no downtime. Male or female patients with hair loss or thinning hair can expect to see improved results in the areas where miniaturization of hair follicles has occurred. Hair Mass Index, as measured with HairCheck typically improve within 90 days with visible changes seen in 6-12 months*. “ALL PRP IS NOT CREATED EQUAL!” says Dr. Alan Bauman, meaning that different physicians may use VERY different protocols of preparation and application of PRP hair regrowth treatment (e.g. without ECM like BioD or ACell) which significantly affects results. In addition, most doctors performing PRP don’t even bother to measure Hair Mass Index which takes just five minutes to perform. Dr. Bauman recommends a complete hair loss consultation including microscopic HairCam and scientific measurements using HairCheck to evaluate and track hair loss and hair regrowth progress before starting ANY treatment regimen. November 2013 – PRP Hair Regrowth treatment by Dr. Alan Bauman uses a patient’s own blood to create Platelet Rich Plasma or PRP. PRP contains powerful growth factors which have been shown to enhance hair growth without drugs or side effects. New research is underway to determine the effects of adding placenta-derived Amnionic Extracellular Matrix (BioD), an FDA-approved cryopreserved injectable allograft that also contains amnionic stem cells commonly used for tissue regeneration. July 2013 – PRP or Platelet Rich Plasma is a safe non-invasive medical treatment that uses your own body’s blood platelet-derived growth factors to enhance hair regrowth without drugs or surgery. Autologel PRP is often combined with ACell or other tissue-regenerating Extracellular Matrix products. The treatment is immediately followed by mechanical (non-roller) micro-needling using the MicroPen device and low level laser therapy with LaserCap or a clinical in-office device. PRP Hair Growth Treatment is available at Bauman Medical Group in Boca Raton, FL. Scientific measurements with HairCheck are always performed prior to any treatment or procedure and every 90 days thereafter to track results*. January 2013 – Find out how thanks to Dr. Bauman, Procter & Gamble’s (P&G) Pantene Age Defy Expert Advanced Anti-Aging and Hair Thickening Treatments can help solve your toughest hair issues. https://www.eyelash-transplant.com – Chemotherapy for cancer often causes eyelash loss and weak lashes. NBC’s Janice Lieberman follows cancer-survivor, Veronica Garner, before, during and after her eyelash transplant procedure. Dr. Bauman discusses the increasing demand for the cosmetic and reconstructive eyelash transplant procedure which implants living and growing eyelashes into the eyelid. NBC’s TODAY Show features Dr. Alan Bauman’s Eyelash Transplants in a cancer patient with eyelash loss from her chemotherapy treatments. NBC’s TODAY show feature a story about Dr. Bauman’s eyelash transplant procedures. Veronica, Bauman patient, is a breast-cancer survivor who underwent chemotherapy years ago. Unfortunately, her lashes never grew back to their fullest after chemo. Now, years later, she’s looking to regain (and regrow) those lost lashes using a new hair transplant procedure called eyelash transplantation. Janice Lieberman follows Veronica through her eyelash transplant procedure with Dr. Bauman as well as her eyelash care: trimming, tinting, perming and curling. Eyelash transplantation takes about an hour per eye under comfortable local anesthesia while the patient is awake. Today, 60-100 lashes can be transplanted using Dr. Bauman’s advanced eyelash implant techniques. Healing takes approximately one week during which time, manipulation of the eyelashes are prohibited as well as the use of mascara, eyeliner and eye shadow. Transplanted lashes are shed after a week or so, then the implanted lashes will begin to grow–eventually needing to be routinely trimmed and curled. Eyelash transplantation uses hair follicles harvested from the back of the scalp to restore living and growing eyelashes for patients who have weak, thin, sparse or damaged lashes. For many women who have undergone chemotherapy or used eyelash extensions, their eyelashes have become weak. Some women lose their eyelash density, length and diameter with age, depending on health issues, age and genetics and turn to eyelash extensions. When performed improperly, eyelash extensions can cause eyelash loss. Dr. Bauman has authored several textbook chapters on his multiple-follicle eyelash implant “sewing” technique which expands on Dr. Gandleman’s eyelash transplant methods allowing more lashes to be implanted with each transplant procedure. May 2010 – If you are a hairstylist, a ‘bad hair day’ due to hair loss is simply unacceptable. When Bobby, a hairstylist and salon owner, noticed hair loss and a receding hairline he sought the expertise of board-certified hair transplant surgeon, Dr. Alan Bauman of Bauman Medical Group in Boca Raton, FL. Bobby underwent hair transplantation using the advanced NeoGraft system to painlessly harvest hair without a scalpel or stitches. Dr. Bauman artistically implanted the follicles one at a time so the result would be 100% natural. A hair transplant with NeoGraft FUE allows patients to restore their own living and growing hair without a tell-tale linear scar, with a more comfortable recovery, and a quicker return to athletic activity. NeoGraft is a tool, not a ‘magic wand,’ so beware of “NeoGraft Newbies!” Make sure your NeoGraft hair transplant surgeon is board certified in hair restoration, has extensive experience with the NeoGraft device, performs a high-volume of procedures on a full-time basis and has the artistic ability to recreate a natural-looking hairline.